Facing the sea front line in Viserbella di Rimini, Hotel Alsen is a family run 3 star hotel ideal for families and business travelers. It has been recently refurbished and has free parking, WI-FI connection and a range of services for children, including a doctor available 24 hours a day and a baby menu in the restaurant. Admits animals of small and medium size. The hotel is located in Viserbella, a suburb of Rimini north that is quiet and suitable for families. It is right in front of the beach, has a beautiful sea view and allows you to reach the beach just by crossing the seafront. The location is convenient for those traveling for work and wants to reach the Fair and the Palacongressi di Rimini. The rooms have a balcony, on request and for a fee, also with a sea view. All are equipped with LCD satellite TV, telephone, safe, minibar (on request), WI-FI connection, air conditioning, bathroom with shower, hairdryer and complimentary toiletries. Sun terrace, bicycles available, reception open until 24, reading room, elevator, free safety deposit boxes at reception, welcome drink, paid laundry service. PARKING: covered and uncovered, free subject to availability. CONVENTIONS: beach, gym, amusement parks, special tickets for Italia in Miniatura (miniature park). Organized excursions and paid shuttle service. SERVICES FOR DISABLED: entrance on the ground floor, lift for disabled people. PETS: small and medium-sized pets allowed to access the nearby Marina di Viserbella dog beach. LUNCH AND DINNER: local and vegetarian cuisine with home-made products. Every day guests can choose a tasting menu of traditional products from Romagna. Pasta and desserts are homemade. In the hotel: outdoor playground area, strollers, bike with child seat, pediatrician on request and for a fee. In the room: cots, side rails, bottle warmers, baby phones. At meals: baby food , baby menu, high chairs and flexible hours. 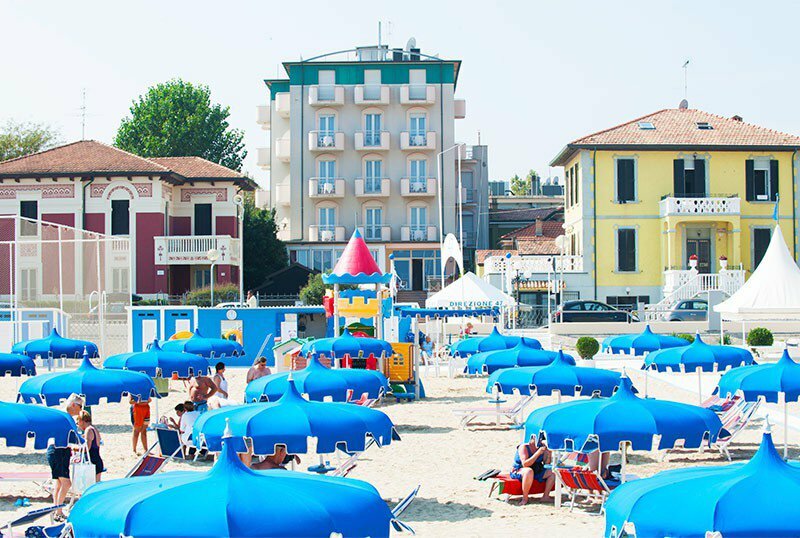 The hotel has an agreement with Bagno Giovanni n. 46-47 and Marina di Viserbella n. 48-49, located in front of the hotel, with children's playground area and entertainment. TOURIST TAX: Excluded. € 1.50 per person per day for a maximum of 7 consecutive nights, excluding children up to 14 years. - Reservations are considered valid only to be followed by the payment of a regular deposit. Don't wait for the last minute! Book your beach holiday in advance and save 10% on your vacation package! Choose the stay you prefer among our vacation packages of minimum 7 nights, book it by April 30 and you can save 10% on the list price. Offer reserved for a limited number of rooms. Offer code to be included in requests: ALSEN10%. Contact us now, we will be happy to think of an offer for you! Easter in Rimini, our OFFER for your EASTER holidays !! Also ... traditional Easter Sunday lunch with delicious specialties from Romagna, a delicious and greedy tribute to your arrival and a lot ... lots of chocolate for everyone! 3. Our many years of experience, family management since 1978. All Inclusive formula with water and wine at the restaurant (bottled not in bulk without limits) included + beach service (1 umbrella and 2 beds) € 64 per night per person !! If you want to enjoy a good fried fish watching the sea .. we are the right hotel for you !! - Possibility to book your place at the beach (2 sunbeds and 1 umbrella) with an exclusive discount ! !